Liverpool will be looking to immediately bounce back from their defeat to United by picking up a point or three at the Emirates. If Liverpool lose and Manchester United win this weekend, it will mean that Henderson's men will be 8 points adrift and effectively out of the race for 4th spot. Losing is not an option, but with questions over Sturridge's fitness Liverpool will have to up their game. There is no doubt in their determination of late and some may argue that their defeat to United is simply a short-term blip. Arsenal will be looking to put their Champions League heartache behind them, by re-qualifying for next season, subject to a strong finish in the Premier League. But who can stop them from finishing in the Top 4? They have conceded less than a goal a game at home this season (11) and have scored the joint most number of goals (33) on their own turf in the Premier League. They are spoilt for choice when it comes to attackers and their defensive unit hasn't been that bad either. I think this will be a close match. As it's a Saturday lunchtime kick off, there will be some weary legs just a few days after the international football "break". We can't take Liverpool for granted - after all, they have the fourth best away record in the Premier League this season. But if Sturridge is less than 70% fit (as I suspect), they could struggle. I think Liverpool could nick a 1-1 draw here, but in truth they need a win. In their haste and without Skrtel's presence they may become complacent at the back. It's in part due to this reason that Arsenal could win 2-1 with the in-form Giroud scoring or Sanchez rediscovering his form. Martin Skrtel’s appeal on the three-match ban has been rejected by the Football Association disciplinary panel, hence a huge responsibility has to be filled at the back line by Rodgers. The Slovakian has been their optimum and most consistent defender this season, however his intolerant stamp on De Gea’s feet on Sunday was tough to be overlooked. Brendan Rodgers wisely rebuilt the side from the back, forming a three-man wall comprising Emre Can, Mamadou Sakho and Skrtel. Back in the FA Cup quarterfinals goalless match against Blackburn, the Reds saw Dejan Lovren, Glen Johnson and Kolo Toure shaping the defense, and it was frantic and frustrating. The fans have finally ignored Lovren’s price tag and extremely happy to just see him warm up the bench. Skrtel will miss the Premier League games at Arsenal and against Newcastle plus the FA Cup quarter-final replay at Blackburn Rovers. 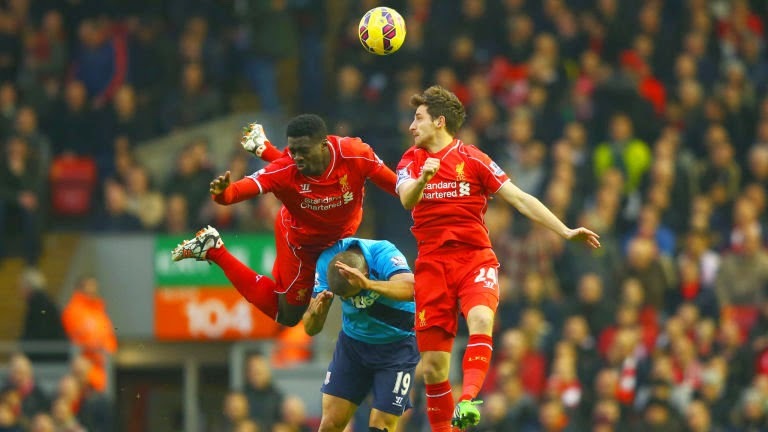 At the Emirates, Toure seems to be the significant replacement for the 30-year old. The Ivory Coast international isn’t the one who offers attacking overlaps or goals, yet he gets his primary job done efficiently with his experience and strength. It could be suicidal if Lovren is the one marking Olivier Giroud who is casually finding the back of the net. Despite expressing regret for the harsh tackle on Ander Herrara, Steven Gerrard is still flocking around the papers and media with destructive remarks. Therefore, the England international will join Skrtel among the spectators too for couple of games. Liverpool were playing eye-catching football with fluidity passing and quick attacking flair without their skipper, plus Jordan Henderson seems to be a tailor-made swap for Gerrard. Moreover, when they were down to 10 men against Manchester United at Anfield, they performed with more enthusiasm and surge upfront. There are plenty of worrying grapevines stating that Daniel Sturridge and Adam Lallana is out with injuries and would miss the crucial clash against Arsenal at the Emirates Stadium. Liverpool supporters will be hoping they could recover within the international friendly break. The former Chelsea man hasn’t been on top notch form yet did find add his name into the score sheet against United. Well, it seems to be a voodoo as both times the Reds faced their arch-rivals Manchester United this season, they stumbled to play their rhythmic football with the 3-4-3 formation. 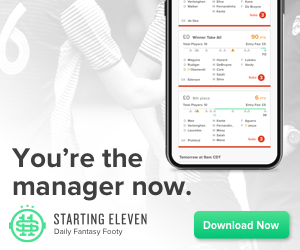 Additionally, fantasy premier league star Raheem Sterling was fruitless, at least he placed plenty of attempts at the United goal back at Old Trafford. Rodgers has put in his heart and soul to craft this new impactful line-up which has been rewarding for them, therefore a sudden change in tactics could lead to disaster at Emirates stadium. Perhaps, if Lallana and Jordan Ibe are still unavailable, Lazar Markovic’s pace could be lethal whereas shifting Raheem Sterling into a false nine is never a bad option. Two bad games doesn’t make it a bad formation, the players didn’t really step up to shine. It was a memorable day for Tottenham's Harry Kane - here's how it unfolded on one author's Twitter feed. Internationals: @hkane28 comes on for his senior @england debut vs Lithuania at Wembley, replacing Wayne Rooney. Congratulations, Harry! The introduction of Spurs' breakthrough player of the year, presumptive Young Player of the Year and possible Golden Boot winner received massive attention across the globe. Of course, FPL managers are notoriously difficult to please. Kane promptly ghosted into the box at the far post and drove a header home for his first senior international goal. It's a minute in, then! Congratulations, Harry. So, two minutes in! Still, job done! Less than a minute into his England debut, Harry Kane heads it in. 4-0 England. The legend grows! Can we get an official ruling? 79 - Harry Kane scored just 1 minute and 19 seconds into his international debut. Golden. So that's sorted. What's the historical impact? Internationals: @hkane28 becomes the 71st Spurs player to represent @england and the eighth Spur to score on his senior Three Lions debut. We may not be able to agree on a time; at least we can all agree on what this means for the future. Arsenal were so close yet so far in the mid-week where they gave a brave battle against Monaco where it ended 2-0, one goal short of qualifying to the quarterfinals of the Champions League. Few signs of lethargies and drop in ambition in the second half bothered them in the second half, however the stubborn backline of the FA Cup holders scrapped through a 2-1 score-line. Olivier Giroud was once again the difference for Arsene Wenger as he notched a sublime brace in the first half, eight goals in the last six matches against Newcastle United, gem finisher! The travelling fans were greatly hoping to see their star striker hit his first hat-trick for the club in the second half but they never came close to do so. The north London club is now with 60 points at third, making a steadfast statement that they are composed mentally to routinely stamp their ticket to Champions League football next season. Despite missing numerous regular starters such as Fabricio Coloccini and Papiss Cisse, Newcastle United started vibrantly, the pace of Ayoze Perez and forcefulness of Sissoko grew anxious moments for the visitors. Arsenal, slowly yet surely picked up their offensive tempo. Aaron Ramsey came close but lacked an instinctive touch to break the goalless stalemate. In the 23th minute, Arsenal’s man of the moment struck, the gloating Giroud. Danny Welbeck deserves immense credit for the opener as his well-taken header was astutely flicked by the left knee of his attacking partner. After all the hard-work in the opening minutes, the Magpies downright divulge their momentum as the Gunners repetitively pilled pressure on their defense. The home team languished, playing deeper and deeper which got them punished once again. The towering Frenchman scored in the space of five minutes once again, using his strong physique, he outmuscled Mike Williamson from the resulting Santi Cazorla corner, directing an excellent header into the far corner that had Tim Krul no chance of reaching. Newcastle United got into the following half with full swing and they found the back of the net with a superb finish by their skipper Moussa Sissoko. A tailor-made cross from Cabella fell precisely for the Frenchman who defeated David Ospina in style. Since then the Magpies kept pressing for an equalizer, endless surge upfront, Perez being their main bull. In the 63rd minute, the Colombian goalkeeper made a marvelous point-blank save from Sissoko’s close range header. Arsene Wenger recognized the space Newcastle were receiving hence brought on Tomas Rosicky and Mathieu Flamini, while attacking duo Sanchez plus Cazorla were sacrificed. Remy Cabella was phenomenal, endless trickery and sprinting through gaps for through passes. Newcastle United’s desire and determination deserves a whole lot of applause. Defensive combatants of Arsenal, Laurent Koscielny and Gabriel Paulista had restless second half, couple of vital interventions and strong aerial clearances. Stoppage time of four minutes was presented, surprisingly the Gunners used it up to run down the clock and the match ended 2-1. Completely entertaining encounter where the home side would be rather wretched after their tireless efforts in the second half. 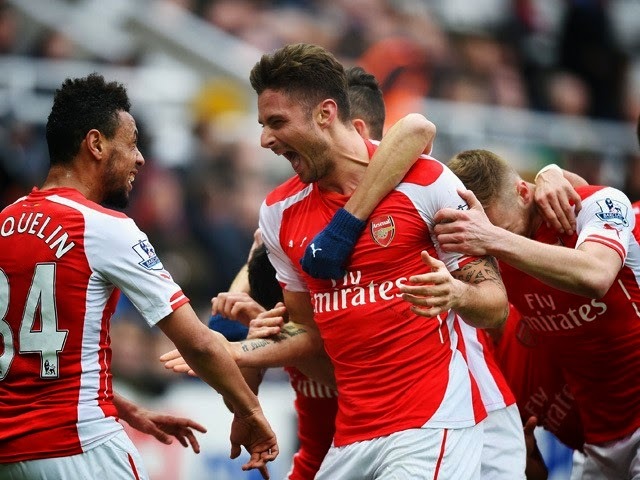 Arsenal rode their luck with the rumble of fantasy premier league star-man Olivier Giroud. *I was close to buying Forster as a long-term buy for the remainder of the season. But he hasn't got a single bap all season despite keeping 13 clean sheets. I opted for Guzan as he is a differential-lite in comparison to Forster, costs £1m less + he has a DGW after the international break. If I opt against buying Costa in DGW34, I could happily buy Courtois as Guzan's replacement in GW33. Yes, that time of the season has arrived - GW30 - it is the final countdown! What a dire GW29. I could have captained almost all of my "Power 7" and still ended up with sub-35 points. My team's rank is spiraling out control. 35k/Top 1% seems a galaxy away from earth. Time to buck up! As per the podcast, I think Benteke is a sensational pick right now, even before DGW31. I was on the cusp of selling Aguero for him, but opted against it as I didn't want to take a hit and needed to replace the injured Foster. 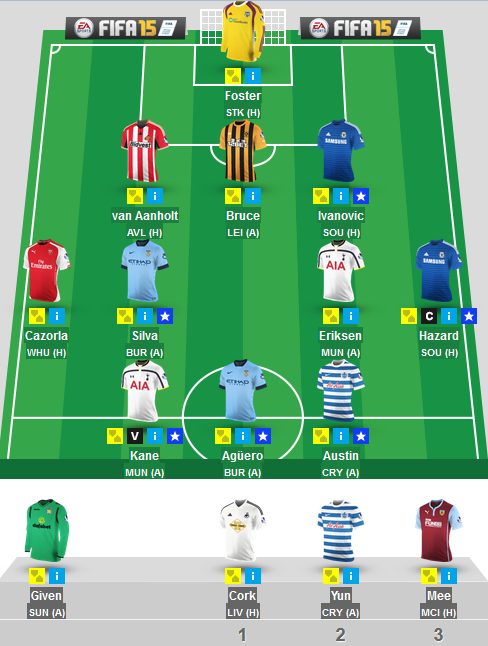 Kane seems like a no nonsense captain pick for this GW, I wanted to play it safe and opted for him. Here's to hoping. Good luck to you all! Also - Try and beat me on Togga's new 'perfect XI' game, via the invite code. Remember him? The Serbian who strenuously bagged in assists in the opening half of the season, especially four assists against Sunderland in the 8-0 riot. He was labelled as the best bargain signing of the summer plus constantly had been compared to Cesc Fabregas. However, since the 17th of January, Tadic hasn’t contributed a goal or an assist for the team, resulting in limited playing minutes too. Evidently, Southampton are struggling to find the back of the net, as once again Saido Mane huffed, puffed and scuffled for a late winner against Crystal Palace at St Mary’s last weekend. Well, Mane could be rewarding for the dream team but not his teammate who only played 31 minutes in the match. If this Sunday, Tadic gets the nod, he will face the likes of Nemanja Matic, Cesc Fabregas as well as Hazard, could be an ordeal afternoon for the confidence-hit midfielder. The Spaniard was nominated as Manchester United’s Player of the Month for February after handful of fascinating performances. Herrera has the ability to run the midfield, demands for the ball at all possible opportunities and never hesitates to try long-range strikes, no wonder he is adamant on filling Paul Scholes void. On the other hand, he was completely inefficient in the FA Cup quarterfinal defeat to Arsenal plus did not make it to the second half, as Van Gaal had enough from the former Athletic Bilbao player. The 25-year old isn’t a player who has earned a sure-starter identity at Manchester United, well under the new boss nobody seems to besides David De Gea. This Sunday, Old Trafford welcome the spirited Spurs who have couple of strong contenders in midfield. Herrera and United need to jostle away their downfall in the FA Cup and attach full focus on Mauricio Pochettino’s team. The Kopites were very much worried on who would be the next Steven Gerrard as he departs from Anfield coming end of the season. Striking wonderful long-range goals and fantastic all-round midfielder, Henderson has been grabbing the headlines in recent weeks. The former Sunderland man is part of an energetic plus accelerating midfield that easily holds possession and creates openings for the attackers upfront. Undeniably, the skipper’s armband pumps an extra gusto for these commanding performances! Liverpool will travel to the Liberty Stadium, which could be a tricky match, yet analyzing the Reds’ league form, mission should be accomplished. 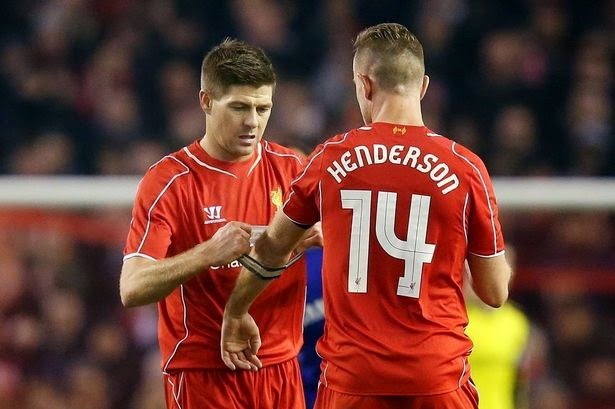 Henderson, who is never short of running, could find the back of the net this weekend too. Eden Hazard – The silky and skillful Belgian has been an influential individual for the Blues this season. Alexis Sanchez – His series of mazy dribbles brought chaos in the QPR defense and he went on doubling Arsenal’s lead last weekend. Raheem Sterling – The Liverpool winger is never afraid to take on multitude of defenders and has notched six goals this campaign. David Silva – The Spaniard is on sizzling form, three goals in the last two appearances. Christian Eriksen – Free-kick specialist of Spurs and has scored couple of mesmerizing long efforts. 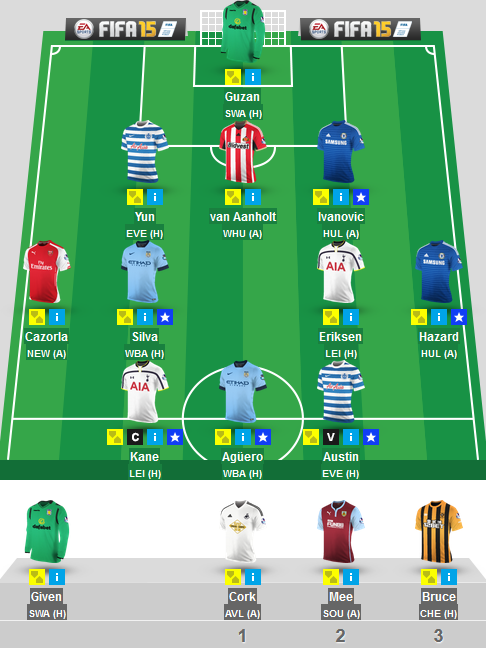 CHANGES: I will now captain Aguero in GW29, the VC will be Hazard. *I needed to break up my faux "Power 8" as I have lost points on the bench from it. Also with Theo not playing it didn't make sense having an expensive player on the bench - instead, a cheap 2 point banker player as sub 3 material made sense, hence Cork was drafted in. All this was done for CFC defensive coverage - I hardly ever take a hit for a defender, but it made sense to get Ivanovic with his impressive stats as a sound investment for the remainder of the season - he could smash the £8m barrier if he carries on performing. What a strange DGW. I had 4 players who played twice and captained Kane who bagged a cool 30 points. In spite of this I fell 1k down the rankings. This was in part due to having a full slate of £shop defenders who didn't do as good - all the more worst when the bigger teams kept clean sheets. This further motivated me to get a high value defender that performs consistently - Ivanovic is worth his price. I know Cork sounds like an odd FPL choice for a midfielder, but with the luck I have had this season, I couldn't afford losing more points on the bench from a high value player - he fits the bill as a replacement and unlocks funds. I decided to captain Hazard as he has form on his side. He may have played 120 mins earlier in the week, but that shouldn't hopefully prevent him from getting a fantasy return as captain. I'm still 20k away from the top 1%, let's hope that can change for the better. Please note, GW33 will be blanks for Arsenal, Aston Villa, QPR and Sunderland. If Liverpool beat Blackburn in the FAC replay, they will also have a blank along with Hull. This means that DGW34 may get bigger or there will be another DGW the week after. 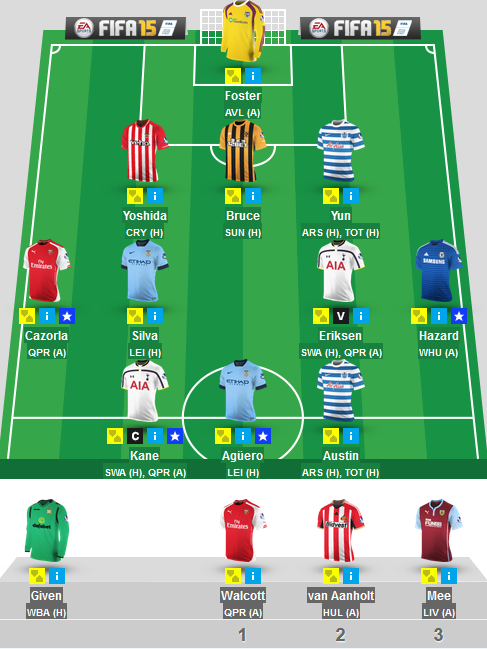 I have my wildcard at hand and will be ready to use it, just before or just after this period. It was no surprise that Papiss Cisse was banned for seven matches following his clash with Jonny Evans in gameweek 28. The Senegalese forward admitted the conduct and was summarily banned (with one extra for an earlier violent conduct charge this season). Evans, however, sought to challenge the allegation and denied the charge. In the end, he was found guilty and will miss Manchester United's FA Cup clash with Arsenal in the 6th round as well as four or five League matches - pending the outcome of Monday's FA Cup match. It is an interesting situation now at Old Trafford where Evans has the fourth most minutes played of any acknowledged defender (1039') but is fifth once Antonio Valencia (1680') is added to the mix. The suspension leaves Louis van Gaal with a first-choice pair of Chris Smalling and Phil Jones in the centre of his defense. Certainly not a bad pair, though no one any FPL manager is rushing to acquire. The suspension may have more of an impact on Valencia and Rojo, with van Gaal electing to keep four at the back given his limited options. Neither player has a goal nor an assist to their credit - in fact in salary-cap leagues like the Official game it is Chris Smalling and his three goals who is the desired United defender - but both possess the ability to attack down the wing. Where Rojo and Valencia would have considerably more value is in fantasy premier league draft leagues like Togga. In any FPL league where you earn points for crosses, successful take-ons and chances created, Rojo and Valencia would typically be snatched-up. The Red Devils, however, face a murderous row in the coming weeks with Tottenham, Liverpool, Man City and Chelsea interrupted only by a visit from Aston Villa in GW31. Each of those sides figure to attack United's weakened defensive ranks, exploiting the slower centre-backs with explosive counter attacking. It is unfortunate, but the 23.1% of FPL managers who still own David de Gea should see the writing on the wall. Spanish Dave has played every League game for United this term and has only nine clean sheets to his credit. A certified shot-stopper of the highest order, he will be under constant pressure in the coming weeks and can not be counted on to keep a clean sheet in any of United's matches between now and gameweek 34. He must be considered a short-term sell and retains little value in daily/weekly weekly leagues against top six opponents. The same is unfortunately true of Papiss Cisse. In fact, one could take it a step further and drop the Newcastle forward for the remainder of the season. Banned from now until 9 May, he will be eligible for only the final three fixtures this season. However, dropping Cisse and forgetting him is no wise move. Though the diminutive 29-year-old will be without match sharpness, he will have the opportunity to return at home against WBA, followed in quick succession by a trip to Loftus Road and the season finale home to West Ham. Cisse is likely without much value in traditional salary-cap leagues and should be dropped immediately but for players tracking possible under-valued commodities for daily fantasy sports leagues - Cisse is one to watch. Finally - a bit of business. 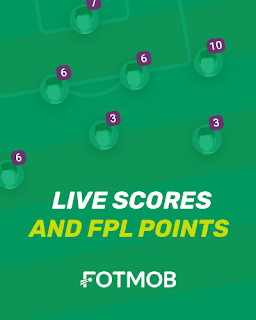 Togga, the fine purveyor of fantasy premier league games by whom I'm employed, is launching a new game this week! Perfect XI is your chance to pick your very best XI without any salary cap limits, team construction constraints or paying an entrance fee. Totally free to sign up! Equally as free to play! Build your own Galacticos. Go with your instinct. Pick on form or allow the dynamic duo of Chris Ramsey and Kevin Bond to do your dirty work and select an all Hoops XI! Play in public leagues, create your own mini-league and play against the best in the World in the global league. For more information and to play against me, follow me using the button below! It doesn't get bigger than this, two English powerhouses collide in the FA Cup quarterfinals to clinch their most optimistic looking trophy this campaign. On Monday night, Arsene Wenger’s men travel to Old Trafford to face a stubborn Manchester United who somehow has the zeal and zest to secure wins regardless the style of play. It’s the oldest association football competition in the world plus both this rivals are tied with 11 trophies each, therefore the winners on Monday have the finest chance to sit at the peak of FA Cup achievement. Louis Van Gaal and Wenger are under skintight battle in the league for the nerve-wracking top four position. Lifting the FA Cup at Wembley and securing Champions League football next season will undoubtedly fulfill the board’s checklist this season. Over the years, numerous classics of excellence have been witnessed between the two prolific clubs, which ensures the upcoming 90 minutes at the red half of Manchester would be a cracker! Back in 1999, 10-men United defeated Arsenal with a sublime strike from wing wizard Ryan Giggs. Then Paul Scholes scored from close range to end the Gunners treble hope back in April 2014 and the Red Devils surged to the final against Milwall. A year after, the North London team tasted revenge when Lehmann leaped as the solo hero as he made a superb save out of Scholes penalty. In February 2008, Old Trafford saw the home side roaring as Arsenal were hammered 4-0 where Emmanuel Eboue was given the marching orders. Finally, in March 2011, the Red Devils made life more miserable for Wenger. Coming into the match after being knocked out of the Champions League by Barcelona plus downfall in the League Cup final to Birmingham City, the Gunners nosedived out of their third competition in a week as United easily crafted their route to the semifinals. It would be a battle between two well-known bosses in the history of football, the professor Wenger vs the philosopher Van Gaal. The Frenchman seems to have excelling tactics to habitually ensure European football for his side plus seizing the FA Cup last season after a rumbustious victory over Hull City in the finals. On the other hand, the Dutchman has covered several leagues and tasted various achievements. No matter which side you’re cheering for victory, both these talismans justify immense respect. Van Gaal has previously managed two giants, Barcelona as well as Bayern Munich who vastly pursued Wenger’s availability, who was fixed to remain at Arsenal. Additionally, the professor has not clinched a victory over the 63-year old. The holders’ boss is renowned for his virtuoso of crafting young players into world-class stars who at times end up with rivals. However, comparing the ratio of victories between the clubs, Wenger’s side are reasonably stuttering on most occasions. The 13-time Premier League champs need to bump out from the mental block which turns their performance lopsided. The best remedies for the visiting warriors would be, pull up your sleeves and fight! On a good day, it’s purely delightful to see them play with fluidity of passes and attacking flair that certainly get opponents to run out of steam. Manchester United and England skipper Wayne Rooney is another key individual who has scored series of wondrous goals against Arsenal. The childhood Evertonian has won five Premier League titles and the Champions League once, yet has not tasted success in the FA Cup. The dream team star has determinedly stated that he is ready to break down the voodoo this time on! Both teams play with different strategies and embrace lethal line of attack which could be the turning point to mount into the semifinals. Will Wayne Rooney spark magic from the middle of the park or Sanchez’s mercurial runs into the box bringing chaos in the penalty box for the home side? Ensuring goals and stunning dramas! *I sold Baird for Yoshida at 11.29am on Saturday, hence I lost my FT. If he is benched v CRY, I will probably sell him for Rose at the last minute. One step forwards. Two steps backwards. One step forwards. Two steps backwards. My FPL form has been inconsistent of late - pretty $%£$%. I can't deny it, ever since that Giroud red card on Boxing Day, I have been stuck in a horrific FPL rut (where as he has been scoring for fun ever since!) - benching midfielders and strikers (who went on to score), buying Given (WTF?! ), buying Yoshida as a short-term purchase, when I could have bought Bellerin, etc. As with previous seasons, my primary target is to finish the season in the top 1% - 34,650. It will be an arduous slog to hit that target, but c'est la vie. Feeling dejected with a paltry 29 (I have only scored sub-30 only twice before in my FPL career), I was about to activate my wildcard, but decided to keep it for DGW34 as my final "Hadouken" of the season. I decided to sell AdM after his woeful performance v Sunderland - he's lost his bearings and Eriksen seemed a straight swap with his DGW. My other transfer was also fairly easy. Austin has a DGW, Defoe hasn't and the latter has been poor of late. In fairness, I could have also sold Cazorla, Walcott and Yoshida. But I will probably phase them out gradually now. Walcott will probably be sold for a cheap midfielder so that I can free up funds for a classy non-Poundshop defender and Cazorla will probably be kicked out for Ozil - but TBC on that front. Here's to hoping for some points. All the best!